‘Tomb Raider,’ ‘Sherlock Gnomes,’ ‘Orange is the New Black,” More on Home Entertainment … Plus Giveaways!!! TOMB RAIDER. (DVD Artwork). ©Warner Bros. Entertainment. “Tomb Raider” arrives Tuesday June 12 onto 4K Ultra HD Combo Pack, 3D Blu-ray Combo Pack, Blu-ray Combo Pack, DVD and Digital HD. From Warner Bros. Pictures and Metro Goldwyn Mayer Pictures, this year’s theatrically released remake of the popular videogame is a story that sets young and resolute Lara Croft on a path toward becoming a global hero. “Tomb Raider” stars Oscar winner Alicia Vikander (“Ex Machina,” “The Danish Girl”) in the lead role, under the direction of Roar Uthaug (“The Wave”). Oscar winner Graham King (“The Departed”) produced under his GK Films banner. The film also stars Dominic West (“Money Monster,” “300”), Walton Goggins (“The Hateful Eight,” “Django Unchained”), Daniel Wu (“Into the Badlands”) and Oscar nominee Kristin Scott Thomas (“The English Patient”). Lara Croft (Vikander) is the fiercely independent daughter of an eccentric adventurer who vanished when she was scarcely a teen. Now a young woman of 21 without any real focus or purpose, Lara navigates the chaotic streets of trendy East London as a bike courier, barely making the rent. Determined to forge her own path, she refuses to take the reins of her father’s global empire just as staunchly as she rejects the idea that he’s truly gone. Advised to face the facts and move forward after seven years without him, even Lara can’t understand what drives her to finally solve the puzzle of his mysterious death. Uthaug directed “Tomb Raider” from a script by Geneva Robertson-Dworet and Alastair Siddons, with the story by Evan Daugherty and Robertson-Dworet. 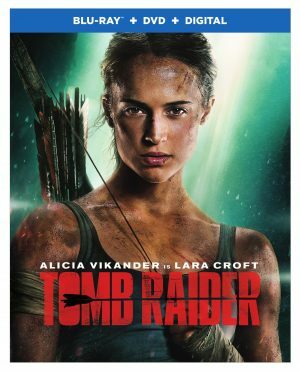 “Tomb Raider” will be available on 4K Ultra HD Combo Pack for $44.95, 3D Blu-ray Combo Pack for $44.95, Blu-ray Combo Pack for $35.99 and DVD for $28.98. The 4K Ultra HD Combo Pack features an Ultra HD Blu-ray disc with the theatrical version in 4K with HDR, a Blu-ray disc featuring the theatrical version and a Digital version of the movie. The Blu-ray Combo Pack features a Blu-ray disc with the film and special features in hi-definition, a DVD with the film in standard definition and a digital version of the movie. The 4K Ultra HD Blu-ray disc of “Tomb Raider” features Dolby Vision HDR that dramatically expands the color palette and contrast range and uses dynamic metadata to automatically optimize the picture for every screen, frame by frame. Bonus features include: “Tomb Raider: Uncovered,” where the cast and crew reveal the challenges—and fun—of bringing Lara Croft’s thrilling adventures of life for a new generation; “Croft Training,” where viewers enter the gym with Vikander as she prepares for the most physically demanding role of her career and transforms into the iconic action hero; “Breaking Down the Rapids,” where viewers can join director Uthaug as he and other members of the cast and crew break down the film’s most exciting action set piece and “Lara Croft: Evolution of an Icon,” which allows viewers to explore the revolutionary the “Tomb Raider” saga from video games to movies, and discover how Lara Croft became one of the most popular and successful female characters of all time. The DVD contains only the first of those bonus features. “Tomb Raider” also is available for purchase from digital retailers. Experience the Oscar winning audience favorite “Forrest Gump” in stunning high definition when a three-disc 4K UHD/Blu-ray Combo Pack with Digital Copy is released Tuesday June 12 from Paramount Home Media Distribution. The Combo Pack is accompanied by over two hours of dynamic bonus features. Tom Hanks gives an astonishing performance as the title character, an everyman whose simple innocence comes to embody a generation in the 20th century. Alongside his mamma (Sally Field), his best friend Bubba (Mykelti Williamson), and his favorite girl Jenny (Robin Wright), Forrest has a ringside seat for the most memorable events of the second half of the 20th century. Winner of six Academy Awards, including Best Picture, Best Director (Robert Zemeckis), and Best Actor (Hanks), “Forrest Gump” remains one of the great movie triumphs of all time. The 4K includes commentary with Zemeckis, producer Steve Starkey and production designer Rick Carter and a separate commentary with producer Wendy Finerman. The Blu-ray also includes those commentaries as well as the featurettes “Musical Signposts to History,” “Greenbow Diary,” “The Art of Screenplay Adaptation,” “Getting Past Impossible—Forrest Gump and the Visual Effects Evolution,” “Little Forrest,” “An Evening with Forrest Gump,” The Magic of Makeup,” “Through the Ears of Forrest Gump,” “Building the World of Gump,” “Seeing is Believing—The Visual Effects of Forrest Gump” and screen tests. “Trading Places and “Coming to America,”, available individually on Blu-ray and Digital Tuesday June 12, 2018 from Paramount Home Media Distribution. Celebrating its 35th anniversary, “Trading Places” pairs Murphy with Dan Aykroyd in director John Landis’ sidesplitting social satire. A small-time con artist switches roles with a big-time stock market maven as part of an idle bet between two mega-rich brothers. But when the truth comes out, the consequences are pure comedy gold. The Blu-ray includes multiple behind-the-scenes featurettes, as well as access to a digital copy. In “Coming to America,” which celebrates its 30th anniversary this year, Murphy reteamed with director John Landis to play a pampered African prince who disguises his identity to roam the U.S. in search of a bride. The film also stars Arsenio Hall and James Earl Jones and features a variety of cameos, including Don Ameche and Ralph Bellamy from “Trading Places.” The Blu-ray includes vintage interviews with the cast, behind-the-scenes featurettes, a photo gallery, and access to a digital copy. “Sherlock Gnomes” brings the fun home in a Blu-ray Combo Pack and DVD Tuesday June 12 from Paramount Home Media Distribution and Metro Goldwyn Mayer Pictures (MGM). The animated action adventure sequel also is available on digital. When Gnomeo (McAvoy) and Juliet (Blunt) discover their friends and family have gone missing, there’s only one gnome to call—the legendary detective Sherlock Gnomes (Depp). Working together, the mystery takes them beyond the garden walls and across the city on an unforgettable journey to save the day and bring the gnomes home. The Blu-ray Combo Pack is loaded with nearly 45 minutes of bonus content. Meet the all-star cast and discover how this hilarious family adventure was brought to life. Plus, enjoy the new music video “Stronger Than I Ever Was,” learn how to draw some of your favorite Gnomes, and more. Warner Bros. Home Entertainment is taking viewers over the rainbow, to the magical Land of Oz with the DVD release of “Dorothy and the Wizard of Oz: Emerald City Season One Volume Two,” available Tuesday June 12. Close your eyes and click your heels together three times for more animated adventures featuring Dorothy, the plucky Kansas farm girl and her adorable dog Toto, as they star in 10 episodes featured on this entertaining, new release. “Dorothy and the Wizard of Oz: Emerald City Season One Volume Two” will retail for $14.97 SRP. All episodes featured are also available to own on Digital HD via purchase from digital retailers. 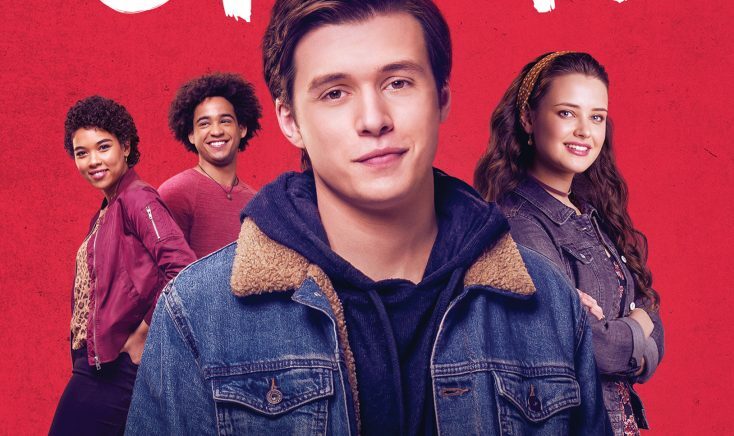 From the producers of “The Fault in Our Stars” comes the relatable and heartfelt coming-of-age film “Love, Simon,” available Tuesday June 12 on 4K Ultra HD, Blu-ray and DVD. Everyone deserves a great love story, but for 17-year-old Simon, it’s a bit complicated. The gay teenager hasn’t come out yet, and doesn’t know the identity of the anonymous classmate he’s fallen for online. Resolving both issues will be a hilarious, scary, life-changing adventure. The romantic comedy also is available digitally on Movies Anywhere. Relive some of the greatest film moments from comedy legend and Hollywood icon Jerry Lewis with the new “Jerry Lewis 10 Film Collection,” arriving on DVD Tuesday June 12, from Paramount Home Media Distribution. Celebrated for his remarkable range of characters, outlandish antics, and uninhibited physicality, Jerry Lewis’ work continues to delight audiences around the world and inspire new generations of comedians. Featuring 10 of Lewis’ most beloved comedies, the box set is headlined by 1963’s enduring classic “The Nutty Professor,” which celebrates its 55th anniversary this year. Considered by many to be Lewis’ finest and most memorable film, this comedy was included on the American Film Institute’s list of the 100 funniest American films of all time and was selected for preservation in the U.S. National Film Registry by the Library of Congress in 2004. Guy Pierce and Pierce Brosnan join Minnie Driver and Jamie Kennedy in the riveting thriller “Spinning Man,” arriving on Blu-ray (plus Digital), DVD, and Digital Tuesday June 12 from Lionsgate. This film currently is available On Demand. Based on the book “The Spinning Man” by George Harrar, and written for the screen by Matthew Aldrich, a professor’s life spirals out of control when he becomes the prime suspect in the disappearance of a female college student. Family man and distinguished college professor Evan Birch’s (Pearce) life is turned upside down when a 17-year-old girl goes missing. Circumstantial evidence has convinced gruff Detective Malloy (Brosnan) that Birch is a prime suspect. As Malloy begins to peel back the layers of Birch’s past indiscretions with female students, and Birch’s wife (Driver) begins to question his alibi, Birch’s life starts to unravel, and suddenly the questions that he faces aren’t merely academic — they’re a matter of life and death. Included in the bonus features is a commentary with the director Simon Kaijser and a behind-the-scenes featurette, along with deleted scenes and a trailer gallery. The “Spinning Man” Blu-ray and DVD will be available for the suggested retail price of $21.99 and $19.98 (SRP), respectively. Following the acclaim for his first feature film “Hide and Seek,” South Korean writer/director Huh Jung returns to the genre that made him famous with his sophomore horror-thriller “The Mimic,” generating terror on digital and Blu-ray Tuesday June 12, from Well Go USA Entertainment. Based on the mythological “Tiger of Mt. Jang,” where a legendary ghost that mimics humans, a woman takes in a lost girl she finds near the mysterious Mt. Jang and mystifying things begin to happen to her frightened family. The horror flick stars Yum Jung-Ah (“Tell Me Something”), Park Hyuk-Kwon (“A Taxi Driver”, Shin Rin-Ah (“Ode To My Father”), Heo Jin (“The Wailing”), Kil Hae-Yeon (“Missing”) and Lee Yool (“Hello Murderer”). “The Strangers: Prey at Night” arrives Blu-ray, DVD and On Demand Tuesday June 12. Inspired by the 2008 cult classic “The Strangers,” the horror flick is based on real events surrounding a family struggling to survive as they are attacked on their vacation by a trio of masked psychopaths that hunt their prey with seemingly no rhyme or reason. Director Johannes Roberts (“47 Meters Down”) pays homage to “The Strangers” by bringing back the infamous masked villains—Dollface, Pin-Up Girl and Man in the Mask—and incorporates elements of the ‘80s slasher genre to create a perfect mix of old and new that is sure to satisfy and reignite fear in fans of the original while also bringing new devotees to the franchise. It also is available now on Digital. The home entertainment editions are packed with exclusive bonus content including a never-before-seen alternate ending and an unrated version that brings the chaos and horror of the film to a whole new level. A family’s road trip takes a dangerous turn when they arrive at a secluded mobile home park to stay with relatives and find it mysteriously deserted. Under the cover of darkness, three masked psychopaths pay them a visit to test the family’s every limit as they struggle to survive. Johannes Roberts directs this horror film featuring Christina Hendricks (“Mad Men”), Bailee Madison (“Don’t Be Afraid of the Dark”), Martin Henderson (“The Ring”) and Lewis Pullman (“Battle of the Sexes”). The action-packed series “Supply and Demand” stars Eammon Walker (“Chicago Fire”) as a street-smart undercover officer who joins an elite squad to track down drug dealers, human traffickers, and other dangerous criminals. It also stars Benedict Wong (“Doctor Strange”) and Miriam Margolyes (“Miss Fisher’s Murder Mysteries”). In “Killer Net,” A psychology student becomes obsessed with a computer game about planning a murder, but when his ex-girlfriend is killed in real life, he fears it may be more than a game. This chilling miniseries stars Tam Williams (“Spectre)” and Paul Bettany (the “Avengers” films). “Mind Games” stars Fiona Shaw (Harry Potter films, True Blood) plays a former nun turned criminal profiler trying to catch a killer who beat two women to death in their homes. It also stars Colin Salmon (24: Live Another Day) and Oscar nominee Chiwetel Ejiofor (“12 Years a Slave”). The suggested retail price (SRP) is $59.99. “Supply & Demand,” “Killer Net” and “Mind Games” also available for streaming on Acorn TV. A new state of chaos descends upon Litchfield Penitentiary in “Orange is the New Black: Season Five,” arriving on Blu-ray (plus Digital), DVD, and Digital Tuesday June 12 from Lionsgate. From Emmy Award-winner Jenji Kohan, the fifth season centers an inmate riot and standoff following Poussey’s death (in Season Four), as they gain control of the prison. Nominated for 19 Primetime Emmys and winner of the 2017 SAG Award for Outstanding Performance by an Ensemble in a Comedy Series, “Orange Is the New Black: Season Five” features an all-star cast led by Taylor Schilling, Natasha Lyonne, Laura Prepon, Kate Mulgrew, Uzo Aduba, Michael Harney, Taryn Manning, with guest stars Lori Petty, Laverne Cox and Samira Wiley. The power dynamics at Litchfield shift dramatically as the inmates react to tragedy in the explosive fifth season of “Orange Is the New Black.” When the standoff at the prison turns into a full-blown riot, the inmates take advantage of the confusion by conducting séances, holding prisoner auctions, and preening for the morning news. With relationships tested and friendships starting to fray, viewers will have to wait and see if life at Litchfield ever return to normal. The “Orange Is the New Black: Season Five” Blu-ray and DVD include a hilarious, never-before-seen gag reel; a “72 Hours in 6 Months: Stories of the Season” featurette, which includes personal anecdotes from cast about what it was like to film the season; and audio commentaries, and will be available for $34.97 (SRP) and $34.98 (SRP), respectively. Also available Tuesday June 12, “Orange Is the New Black: Seasons 1-4,” for $49.98 (SRP). After a 10-year hiatus, audiences are thrilled that the multiple Primetime Emmy Award-winning original series “Will & Grace” is back and “just as incredible as the original series – hilarious, poignant, and contemporary” (Entertainment Weekly). As Eric McCormack, Debra Messing, Sean Hayes and Megan Mullally reprise their acclaimed roles as Will, Grace, Jack and Karen, the new season picks back up right where it left off—best friends navigating life together once again. Now fans everywhere can own all 16 episodes plus exclusive bonus features including deleted scenes, a gag reel, a featurette on reuniting the team and a cast and crew discussion on what made the original series so special and why it remains relevant. From creators Max Mutchnick and David Kohan, “Will & Grace (The Revival): Season One” arrives on DVD Tuesday June 12, from Universal Pictures Home Entertainment. A decade after their unforgettable eight-season run, comedy’s most fabulous foursome is reunited and joined by outstanding guest-stars Bobby Cannavale, Harry Connick Jr., Jennifer Lopez, Alec Baldwin, Minnie Driver and others. The legendary James Burrows, director of the original “Will & Grace” series, returns along with a slew of razor-sharp jabs and dirty martinis. Front Row Features is celebrating Christmas in July early this year, as we’re giving away several new releases on Blu-ray and DVD this week for some fun summer viewing. For horror fanatics, we have an unrated copy of “The Stranger: Prey at Night” we’re giving away on Blu-ray as well as five Blu-ray copies of the South Korean horror-thriller “The Mimic;” for families, we have two Blu-ray copies of the animated adventure “Sherlock Gnomes;” and for comedy fans, we have three copies of “Will & Grace (The Revival): Season One” on DVD and two copies of the “Jerry Lewis 10 Film Collection” on DVD. As if that wasn’t enough, to celebrate the 35th and 30th anniversaries of Eddie Murphy’s “Trading Places” and “Coming to America,” we will also be giving away both classic comedies on Blu-ray to two lucky readers. To enter the contests, simply email socalmovieeditor@aol.com by Monday June 18 with the title of which release you want to win in the subject line for your chance to win. Good luck! Next PostPhotos: ‘Tomb Raider,’ ‘Sherlock Gnomes,’ ‘Orange is the New Black,” More on Home Entertainment … Plus Giveaways!!! ‘Light Between Oceans,’ ‘The Code,’ ‘Peanuts,’ More on Home Entertainment … plus giveaways!! !